The Trade Union Congress gave unanimous support for the 'Fourth Option' at the beginning of September. UNITE and UNISON, Britain's two biggest unions both put motions, moved by their respective general secretaries, to back the campaign. Civil servants (PCS), firefighters (FBU), bulding workers (UCATT), council workers (GMB) and railway workers (TSSA) also spoke in support. Two Composite motions were debated. Several paragraphs of the DCH model motion (which became Composite 6) were incorporated into an alternative less critical of government Composite 7. But even this "calls on government to give existing council tenants the right to choose to remain with their authority and get improvements to their homes and estates", "notes the success of campaigners to put council house building back on the political agenda" and agrees to "Provide a long term future and direct investment to council housing". 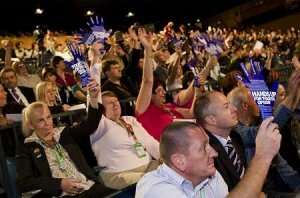 Contemporary Motions at the conference were referred to the Labour Parties new policy framework instead of being put to the vote. In the meantime we are advised that the existing policy (Composite 10, 2006 conference) including "Conference again calls on government to provide the 'Fourth Option' of direct investment to council housing as a matter of urgency" stands. It is crucial that tenants, trade unions, councillors and MPs resist any further privatisation of council housing (organise against any stock transfers in your area) and demand a full public debate about housing priorities before any public land is sold off to developers. See the DCH conference bulletin, Austin's statement, pre conference Labour grassroots ready to fight for security of tenure and post conference analysis from Party urged to hand freedoms to landlord councils and	24Dash and Inside Housing blog. Send a formal response to the government's Housing Green Paper (deadline October 15). A simple submission could list and support DCH's five demands and the principle that all rental income and capital receipts should be ring-fenced and reinvested with some of the historic profits from capital receipts used to fund the remaining gap to enable councils to modernise all tenants homes and estates. Organise a Hands Up for 'Fourth Option' photo opportunity with tenants, trade unionists, MPs & councillors to get press coverage for the demand that government improve existing and build new first class council homes. Oppose any privatisation in your area/region and demand an informed public debate about housing priorities before any public land is sold off.